Can you figure out the best healthy Chinese food options when you're at your favorite restaurant? Or perhaps you like to cook Chinese food at home. Do you know which Chinese food is healthiest to prepare? And what about Chinese food calories? If you're on a diet to improve your health or lose weight, use this guide to choose low-calorie Chinese food at home or out on the town. If you're at your local Chinese restaurant, take some time to evaluate the menu before you order. There are often pages and pages of choices and the names of the foods are not always familiar. If you don't recognize certain ingredients or preparation methods, be sure to ask your server to get important nutritional information before you make your final decision. You can also ask for your meal to be tailored to your dietary needs. Ask for entrees or appetizers to be customized to include more steamed vegetables or whole grains. Ask for sauces on the side or for high-fat, high-calorie side dishes to be replaced with fiber-rich veggies or lean protein. If you're trying to cut back on starchy carbohydrates, ask for brown rice instead of white rice. Brown rice provides more diet-friendly fiber that can help you feel full to eat less. Chow mein is one of the most popular dishes on the menu at Chinese restaurants, especially in the United States. Chow mein is a fried egg noodle dish. Often, stir-fried meat or vegetables are added to the dish. The calories in chow mein are not very high (as indicated on the Nutrition Facts label) but keep in mind the calorie and fat counts are for a one-cup serving. Diners often eat two or three cups when they dine in a family-style Chinese restaurant. Egg rolls are another popular Chinese menu item. Nutrition for egg rolls will vary depending on how they are prepared. Fried egg rolls with pork or shrimp can provide 100-200 calories per roll. 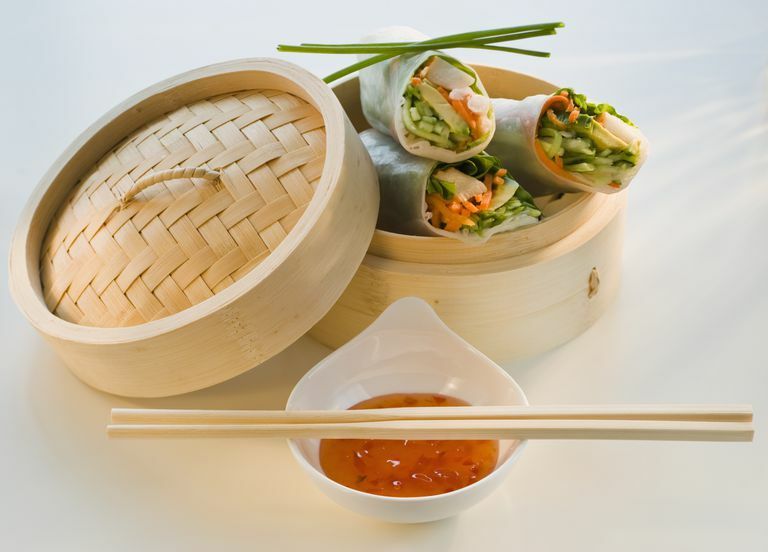 But steamed rice paper egg rolls are likely to provide less than 100 calories per roll. Even though many traditional Chinese foods are healthy, some are not. Foods that are fried or covered in sweet or creamy sauces are likely to be high in fat, high in sugar and high in calories. You can always order these foods and try to eat just a small portion, but that can be tricky in a Chinese restaurant because foods are often served family-style. If you are trying to limit your salt intake, you should also ask your server for recommendations. Many Chinese foods (especially Chinese take-out foods) are prepared with a lot of sodium. If you love Chinese food, you'll save calories and money if you cook it at home. When you choose a healthy Chinese food recipe, you can control the ingredients and even swap out ingredients to lower the fat and calorie content. Try any of these recipes at home: brothy Chinese noodles, Szechuan tofu and green bean stir-fry, or sweet and sour chicken with brown rice.